"A new twist on chicken taco soup both for those vegetarians/vegans out there, or those simply trying to eat less meat. This is a very budget friendly and filling meal that will please even the pickiest eater!" Combine three-bean mix, black beans, pinto beans, corn, tomatoes, tomato sauce, onion, green chile peppers, green bell pepper, taco seasoning, and garlic in a slow cooker. Add beer and give mixture a good stir. Cook on Low until flavors combine, 5 to 9 hours. Serve topped with crushed tortilla chips and green onions. 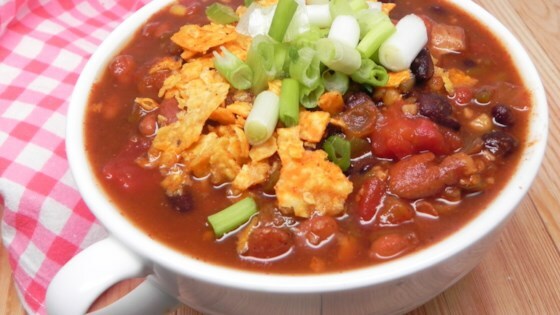 See how to make a 5-star, beefy taco soup with beans. You can dice the onion, green pepper, and garlic the night before to save time. Substitute vegetable broth for the beer if preferred.